Not too long ago I would have called my weekend gatherings clinics. Now I have a new name for them: TRAINING INTENSIVES. For years at clinics people have been saying I need to call my work something other than clicker training. “What you teach is so much more than just clicker training,” they would say. I would challenge them to come up with a name. “What would you call it?” I would ask them. I’d get a few suggestions, but none of them had any staying power. I see clicker training as a huge, all-inclusive umbrella. So many different kinds of training activities fit under that name. My passion is balance. That’s what I spend my training time focused on. In truth that’s universal. If you want to jump well, your horse needs to be balanced. If you want to ride out over back-country trails, your horse needs to be balanced. If you want a relaxed companion to walk with you down the lane, your horse needs to be emotionally balanced. Here’s what I wrote recently about balance: “Balance is everything. It is life-giving, life sustaining. It is beauty, grace, power. It is love.” Those are powerful words indeed, but this is what my horses have taught me. Balance is at the core of everything I teach. But what “Balance” means to me may not be at all what someone else thinks about when they use that word. Balance has become an overworked term, as has harmony; partnership; relationship; connection, etc. We all want these things. And we all claim to have them. You can have two trainers working in absolutely polar opposite ways each claiming that their work creates all of the above. So these labels didn’t work for me. I preferred clicker training. That name tells you right away so many things about how I train. You know a great deal about my methods and the type of relationship I am looking for. What it doesn’t tell you is WHAT I train, and that’s a good thing. WHAT I train is not nearly as important as HOW I train. If I can teach you the process, you can teach your horse anything you want. We don’t have to have overlapping interests to share a productive training conversation. What do YOU want to train? Is it tricks? Is it jumping? Is it dressage? Is it simply polite stable manners? All this and more belongs under the clicker training umbrella. So WHAT I teach didn’t help me to define my work. Yes, my passion is balance. That is the central core of what I teach, but that isn’t enough to describe the clinic experience. And it doesn’t describe what You are going to be teaching your horse. What do you want your horse experience to be? What is on your wish list? What fits under the clicker umbrella is determined not so much by WHAT we teach but HOW we teach it. How I teach has been evolving over the past thirty years. Long before I had ever heard of clicker training I learned some important lessons that have led to the way I teach today. 1.) 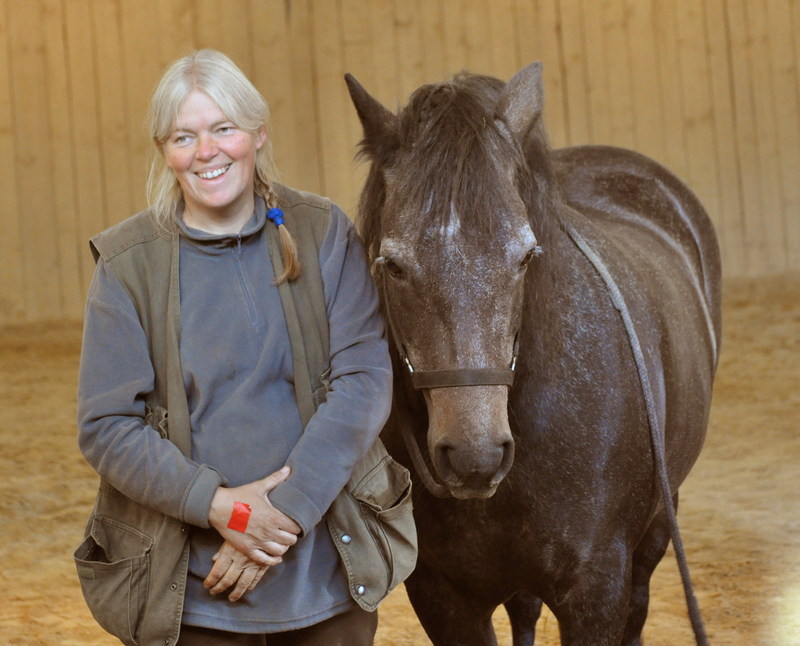 I learned to break lessons down into very small steps – both for the horse and the handler. However small a step might seem, there is always a smaller step we can find. Whether it is learning a new skill to advance the training, or solving a behavioral problem that is blocking progress, the approach is the same: look for the solutions in the underlying layers. Break your training down into smaller steps. Build the components first, and then assemble them into the desired, goal behavior. 2.) The best way to develop new skills is away from your horse. Especially if you are encountering problems, trying to learn new things while you are also trying to manage your horse can create a lot of frustration. The fastest way forward is to let your horse spend the lesson time eating hay. That frees you up to concentrate on the skills you need to learn. Learning those skills BEFORE you go to the horse produces much cleaner, better results. 3.) Working slowly leads to faster progress. What do I mean by working slowly? I mean going through “dress rehearsals” without your horse where you literally slow movement down. Doing things fast is a great way to miss mistakes. It’s those mistakes that accumulate one on top of another to create real roadblocks to progress. When you take time to examine the inner workings of how something is done, you find yourself on a compelling voyage of discovery. You learn how to analyze and adjust small details that in the past would have gone unnoticed, but it is those details that matter most to the horses. They notice everything! When I teach, I begin by first asking the handler describe her horse and her training goals. I find out what she wants to achieve. Then I watch them together. I am “collecting data”. I watch for the little details that can make a huge difference. Does the handler have the skills needed for the lesson she is trying to teach? What training choices is she making? What can I add to make things even better? The first steps towards answering these questions often involves putting the horse away so the handler can focus on what she needs to learn. When we’ve worked for a bit on the new skills, we bring the horse back out and ask him what he thinks. How did we do? What do we need to work on next? Always it is the horse who gets to evaluate our “homework”. He has the final say in how well we have done. Even before I knew anything about clicker training, this was the approach I used. The metaphor I think of is that of a huge brick wall. The wall is the training problem we’re working on. There will be a few horses who are athletic enough and riders who are skilled enough to go directly over the wall. In other words they will tackle the problem head on. If they’re successful, that will tempt them to take the next horse straight over, and the next. And it will also tempt them to make the wall ever higher. Eventually they will either make the wall so high no horse can jump it, or they will try and force a horse over the wall who truly can’t make it. Either way, eventually they will crash. If you lower that fence, more horses and more riders will be able to jump it successfully, but there will still be some who can’t. They either lack the physical ability, the skills, or the confidence to jump it. Lower it a bit more and some who couldn’t jump it before will now be successful. Turn it into a cross rail and even more will manage it, but even there, you will have some individuals who can’t manage even a small jump. You may have to turn it into a ground pole, or draw a line in the dirt – or you may need to find a way to go around the jump altogether rather than over it. Finding these alternatives are the small steps that we can break any lesson down into. Finding those small steps for our horses builds their confidence and a habit of saying “yes” instead of “no” to simple requests. When I’m confronted by a “brick wall” of a behavioral problem, I prefer either to find a way around it, or to dismantle it so I only have to ask my horse to go over a few small bricks. If you pull enough layers off the brick wall, you will eventually get to the point where every horse and every handler can be successful. In the clinics I show people how to pull the “brick wall” apart and then how to rebuild it in a way that it is no longer a barrier. It turns out I’m not the only one who uses this type of approach. In his book, “The Talent Code”, Daniel Coyle visited what he referred to as talent hotspots. These were places where teachers were turning out a high percentage of world-class performers. He visited a tennis camp in Russia that was producing some of the world’s top players, and a music school in upstate New York that was filling concert halls with the musicians it graduated. Music and tennis may seem worlds apart, but the teaching methods that produced such outstanding results had much in common. At the tennis camp students weren’t out on a court hitting balls. They were inside swinging in slow motion imaginary racquets in order to perfect their technique. At the music camp students slowed single lines of music down so much it sounded more like whale songs than anything you would hear in a symphony hall. Sound familiar? This is very much what we do when we put the horses away so we can work on the handler’s skills. I do love finding books that agree with me! Who doesn’t. It’s good to get outside confirmation that you are very much on the right track, especially when the track you are on is one you are pioneering. The horses tell us when we’ve chosen well, but they can’t always explain why something is working. The horses could tell me that letting them take a nap while the humans practiced their rope handling skills was a good thing. That seems obvious enough. Working out what you are going to do before you apply it to the horses makes sense. After reading Daniel Coyle’s “The Talent Code”, I now have a much deeper understanding of why. And Daniel Coyle has given me something else, a language that resonates deeply with me. I have words now to describe what I do. Yes, I do indeed teach clicker training, but that is only the beginning. What I am teaching are Deep Practice Techniques. What do you want to learn? That’s the part you bring to the process. How can you best achieve that goal? That’s what I can help you discover. Taken together it’s an exciting journey. I began teaching clicker training clinics across the United States in 1998. 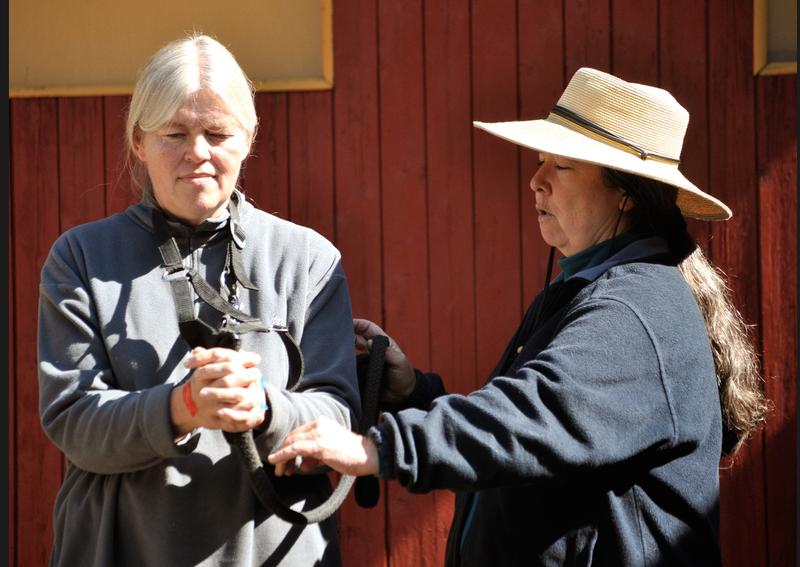 Through the work many talented teams have emerged and become ambassadors for clicker training. Now as my own horses advance in age I intend to travel less. I am going to focus on just a few select clinic locations. These will be my “talent hotspots”, places where you can join me for a three day Deep Practice Training Intensive. We will be looking at clicker training through the lens of Deep Practice techniques. I will also be available at my home barn in upstate New York for Training Intensives. This is an opportunity to build your skills through the Deep Practice techniques that I have been developing over a thirty year span of study and experimentation. Come join me to create your own personal clicker hotspot of talent. Visit my web site: theclickercenter.com for my 2015 event schedule. This entry was posted in Clicker Training and tagged Alexandra Kurland, Clicker Training, Clicker Training Horses, clinic schedule, clinics, Daniel Coyle, Horse Training, On-Line Course, positive reinforcement, The Clicker Center, The Talent Code. Bookmark the permalink. Also, I really like the brick wall metaphor.